Partially coherent radar operation schematics. Credit: Nature Communications. It was commonly believed that radar resolution was proportional to the bandwidth used—the broader the range of frequencies, the more accurate the detection of objects. 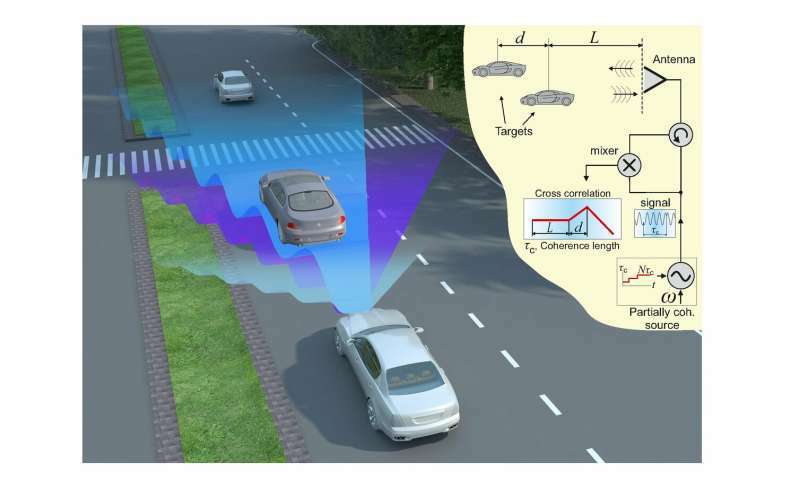 But the TAU researchers have now demonstrated that low-bandwidth radars can achieve similar performance at a lower cost and without broadband signals by exploiting the coherence property of electromagnetic waves. "Our demonstration is just the first step in a series of new approaches to radiofrequency detectors that explore the impact of low-bandwidth radars on traditional fields," Prof. Ginzburg concludes. "We intend to apply this technology to previously unexplored areas, like rescue operations—sensing if an individual is buried in a collapsed building—or street mapping—sensing if a child is about to cross the street behind a bus that conceals him." It seems they're simply shifting the problem to another domain: time. In order to maintain resolution despite the narrower bandwidth, it takes them longer to measure the result. With other radars on the same frequencies, the addition of noise then requires even longer acquisition times to make out any results, and the problem is still the same: all the self-driving vehicles on the road are blinding each other because everyone's using their radars over the same allocated frequency spectrum. It's like two drivers on a dark road. When one sees the headlights of the other coming on, they get blinded and flip on their high beams to see better, so the other one gets blinded even worse and flips on their high beams, and they're both blinded. That's why streetlights were invented, and why self-driving cars should rely on passive sensors.